Great in hot and cold applications. Well balanced savory profile – uses egg yolks as main binder to ensure thick, creamy and rich tasting mayonnaise. Superior performance on binding and coating, ideal for buffets. No gums or starches. Free from artificial flavors & Gluten. Contains Egg/Egg products and Soya bean/Soybean products. 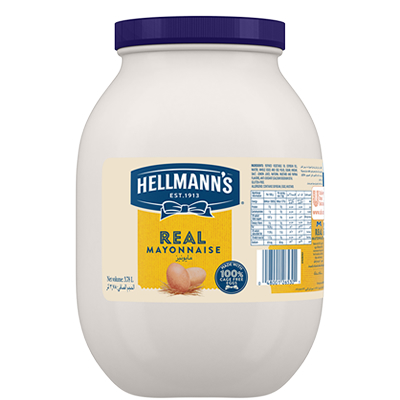 Hellmann's Real Mayonnaise brings out the flavour of quality meat, sandwiches, salads, dips and dressings. It is ranked highest for taste, texture and performance by the Master Chef's Institute™. Ambient (Store in a cool and dry place), Min 4˚C & Max 25˚C. Hellmann's Real is the world's #1 mayonnaise for good reason. Not only are the ingredients of highest quality, but for binding applications you can use up to 30% less than other mayos on the market. Try it on your coleslaw and you will see and taste the difference.